Given that I documented the process of building my house, and many of the design decisions that went into the construction, I receive many questions every week about construction related topics. I am also frequently asked to share my personal resources for where to research and purchase a wide variety of items. 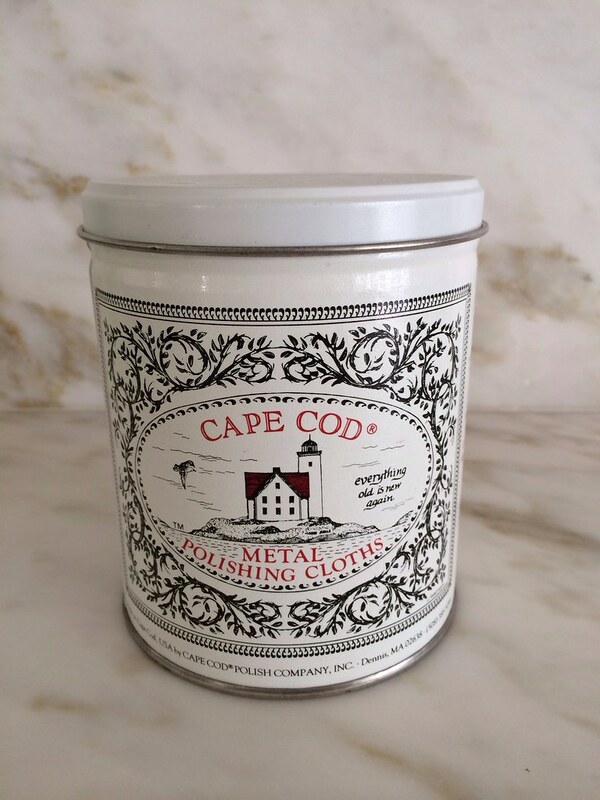 I recently learned about a great resource for bathroom (and kitchen) décor related items. It’s called Decor Planet, and almost anything you could want for a bathroom décor or a bathroom renovation can be found here, from bathroom vanities to bathroom accessories to lighting sinks, faucets, and shower equipment. 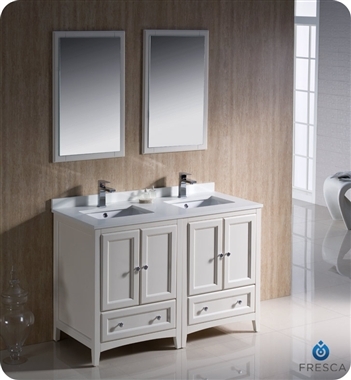 Decor Planet is particularly well known for its enormous selection of beautiful bathroom vanities and accessories. I immediately gravitated towards the bathroom vanity section – I have never seen such a huge selection in every possible style and size. 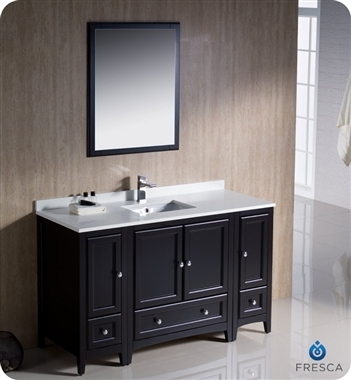 Many of the vanities include the countertop, or offer several styles/materials of countertops available to select, and some of the styles have several color options. As part of the selection process, each style has several recommended faucets and mirrors options (or no faucet or mirror can be selected too), and these can be configured as part of the selection process. Decor Planet truly offers one stop shopping. Here are some of my favorites. 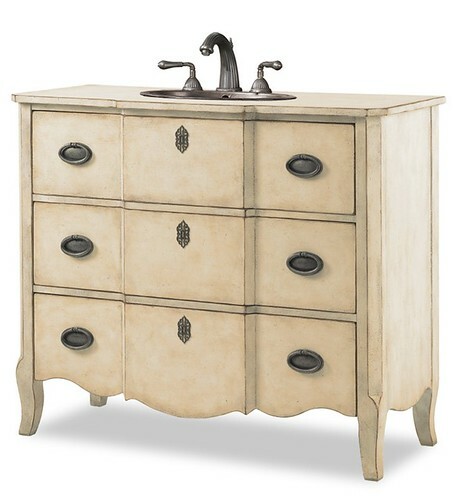 Of course, I lean towards the more traditionally styled vanities, and that is what I am featuring here – the ones I love. However, Decor Planet offers just about every style you can imagine, from contemporary to transitional to traditional. You will have to check it out for yourself! 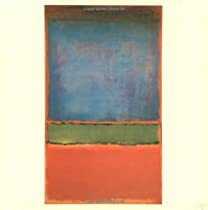 This is my favorite – it has such a beautiful design. 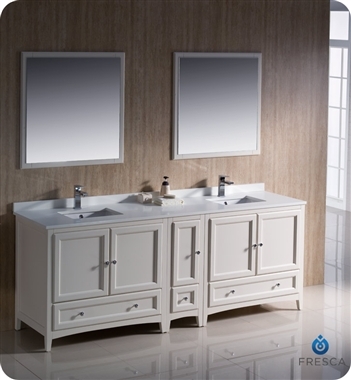 The combination of the mirrored front and the neutral oak with a visage finish would look wonderful in any bathroom, particularly a special powder room. Click here for more details. Another beautiful furniture like style, with incredible detail. Click here to see more detail. 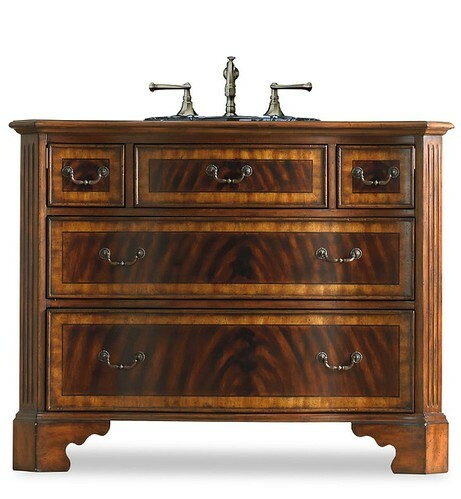 This vanity chest has the elegance of a fine piece of furniture. Click here for more details. 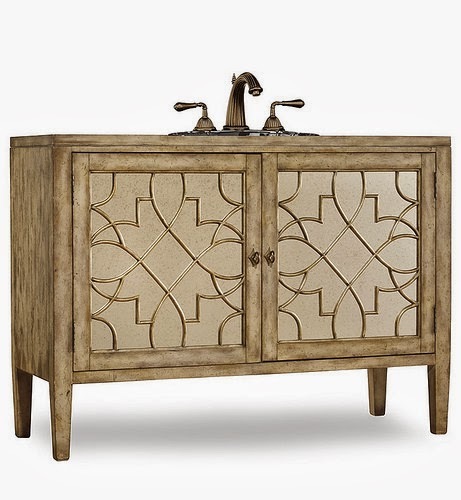 I love the tropical accents on this bathroom vanity, and the bamboo details. Click here for more detail. 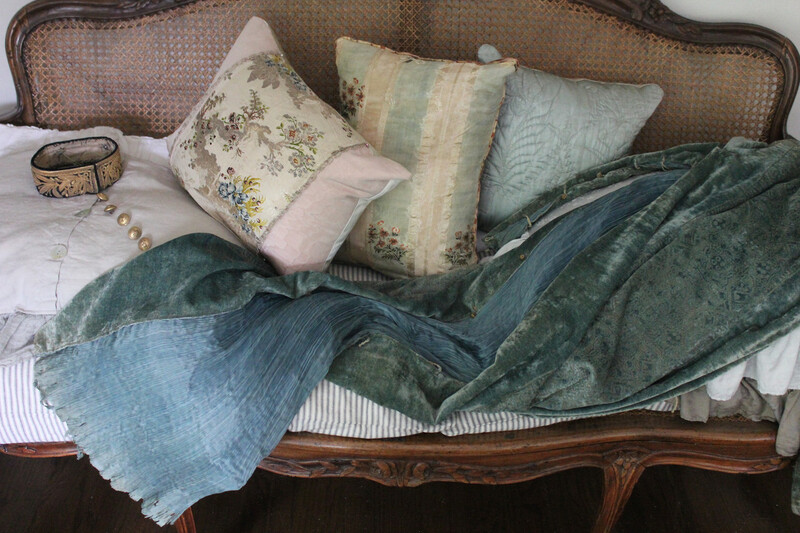 I like the antique linen color of this painted wood piece (it comes in antique linen and antique chestnut). 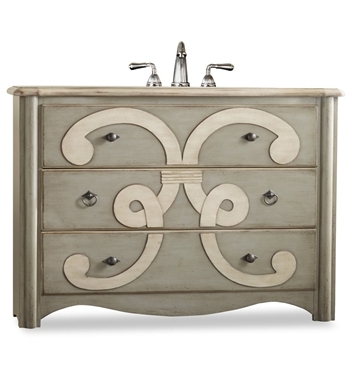 Two of the drawers create storage in this lovely bathroom vanity. Click here for more details. 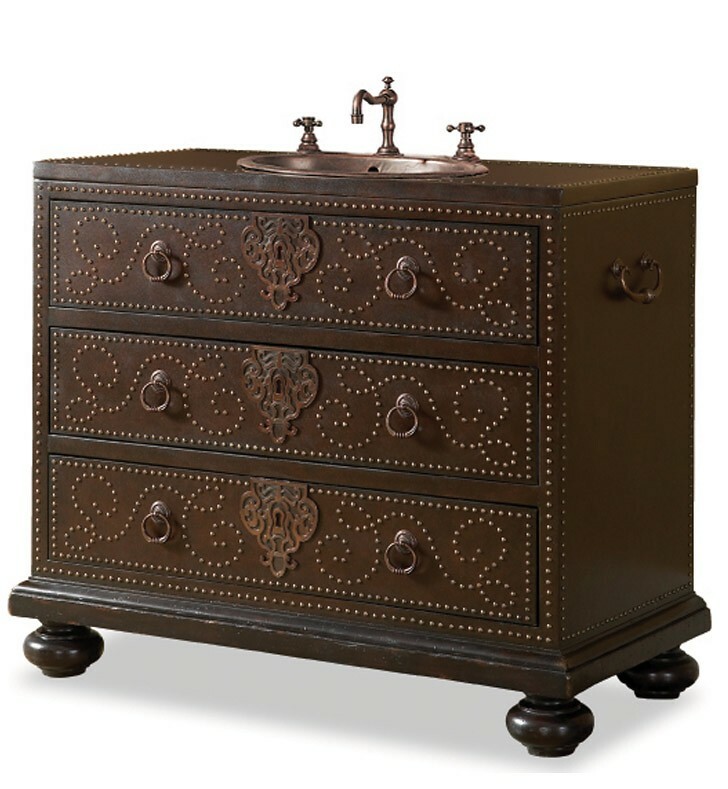 This vanity chest is beautifully reminiscent of chests that I have seen adorning the pages of the top magazines. Click here for more details. This piece is very in vogue, with its gray color, pewter knobs and pulls, and beautiful artistic carved pattern on the front. The drawers are lined in wallpaper, according to the description. Click here for more details. 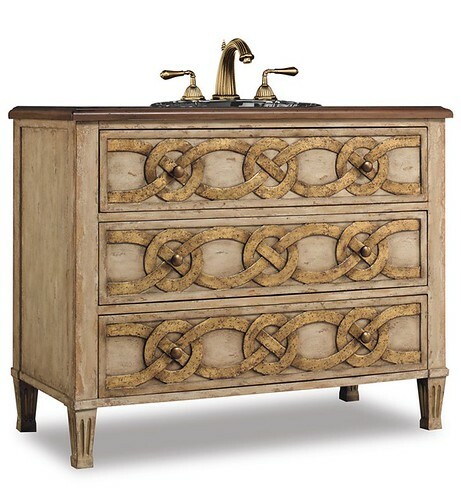 The Middletonsink chest vanity features an intricate knotted circle design. Click here for more details. 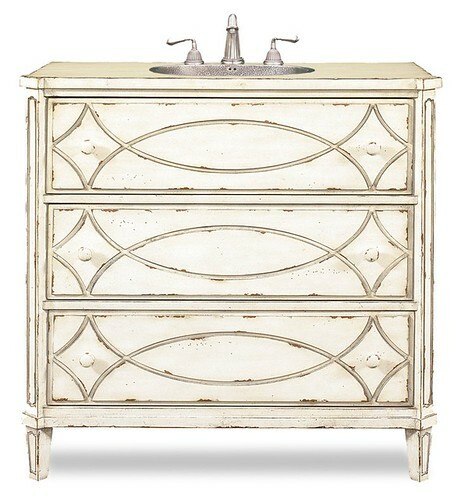 This is a beautifully detailed vanity; I love the oval and diamond patterns. Click here for more details. This is a fun design – hand painted, and beautifully crafted. I love the knobs. Click here for more details. 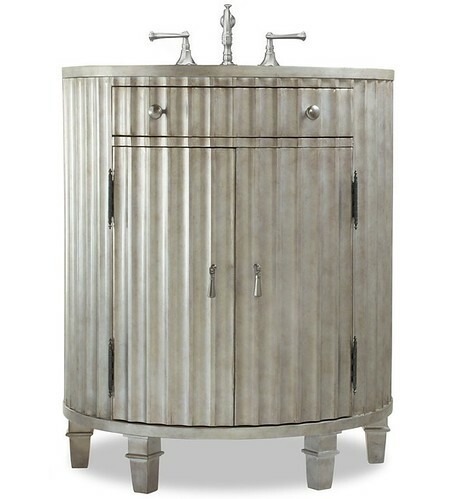 A more transitional design, with antiqued mirrors and elegant round pulls. Click here for more details. Another style that caught my eye – it is great to see it in different colors and sizes. I love the square sink design and clean lines of this style. Click here for more detail. 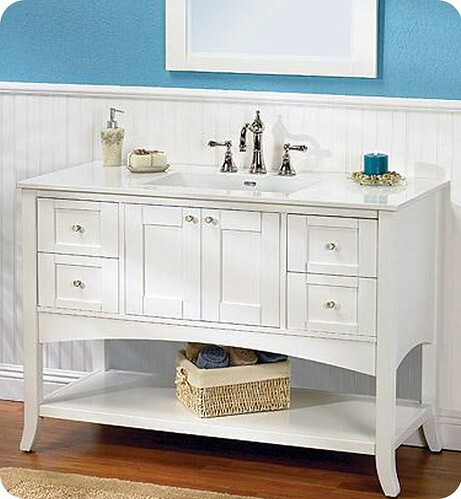 This white Shaker style bathroom vanity would be pretty in many settings. Click here for more details. A shelf under the sink is so useful, and this Shaker style is both beautiful and incredibly versatile. The marble countertop adds a touch of elegance. Click here for more details. I love this style – it’s so classic. 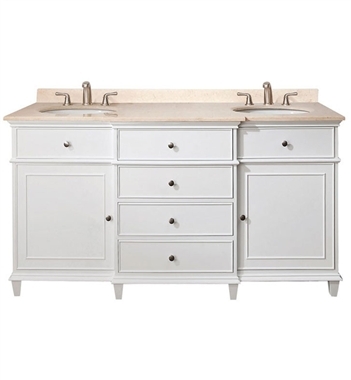 It comes in either white or walnut, with the beige marble countertop, and either a 24” with single sink, 36” with single sink, a 48” with single sink, a 60” with double sink, or a 72” with double sink . The faucet can be added on – these pictures show two different possible styles. I like both. As you can tell, I have a fondness for double sinks! I think it is so nice for a guest bathroom to have double sinks if there is room. 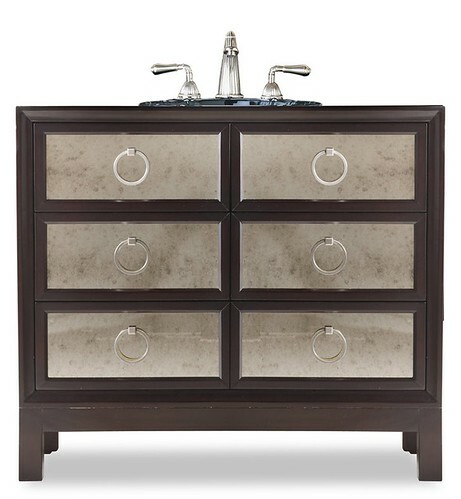 This style is is more transitional and clean lined; the cabinet doors and drawers are inset, a very nice touch. Click here for more details. 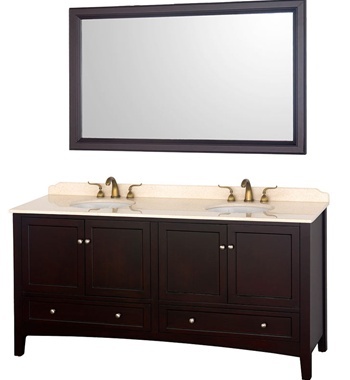 There are also many powder room bathroom vanity options available. This reeded style in a demilune shape caught my eye. Click here for more details. There are so many more beautiful styles, it’s hard to even pick a favorite. 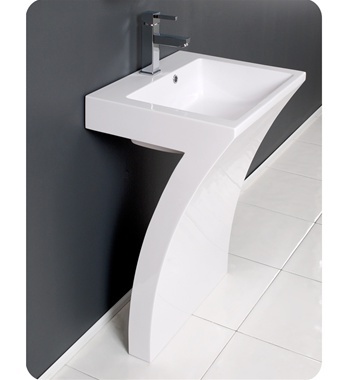 This contemporary vanity is listed as the best seller on the web site – I love how it looks like a number seven from the side! Decor Planet also offers a huge array of bathroom accessories, from towel bars and rings to toilet paper and soap holders to robe hooks. There are hundreds of styles. I really like these styles – a towel ring, towel bar, and hook by Graff. Finally, I noticed that Decor Planet offers amazing pricing on my favorite toilet, the Toto Promenade – this is the toilet that I ordered for every bathroom in my house! Click here for the link. I hope you enjoyed seeing some of my favorite styles from Decor Planet. Visit them online at http://www.decorplanet.com/. 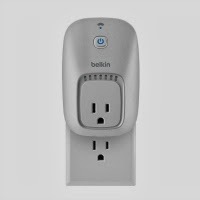 Decor Planet offers free shipping (within the continental US) on most of its products (Canadian shipping available), 110% price match guarantee, and 24/7 sales. 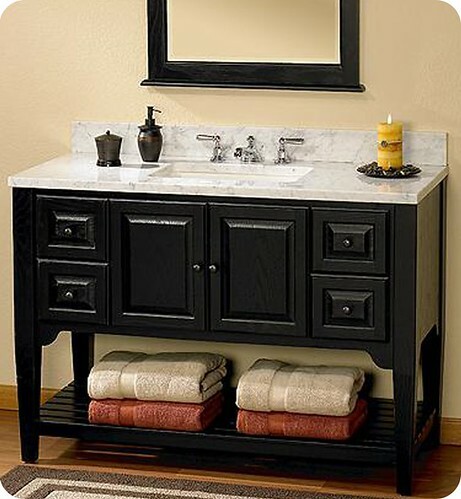 Do you have a favorite bathroom vanity? It’s always great to know about some of the stand out resources on the internet. Please visit Decor Planet for more information. This post was sponsored by Decor Planet, however all opinions are my own. I love it when a vintage dresser or sideboard is topped with marble and a sink dropped in. The perfect vanity style for me. Thank you, thank you, thank you!!!! I am a decorator in a small town, and do not have many of the resources that the city decorators have. 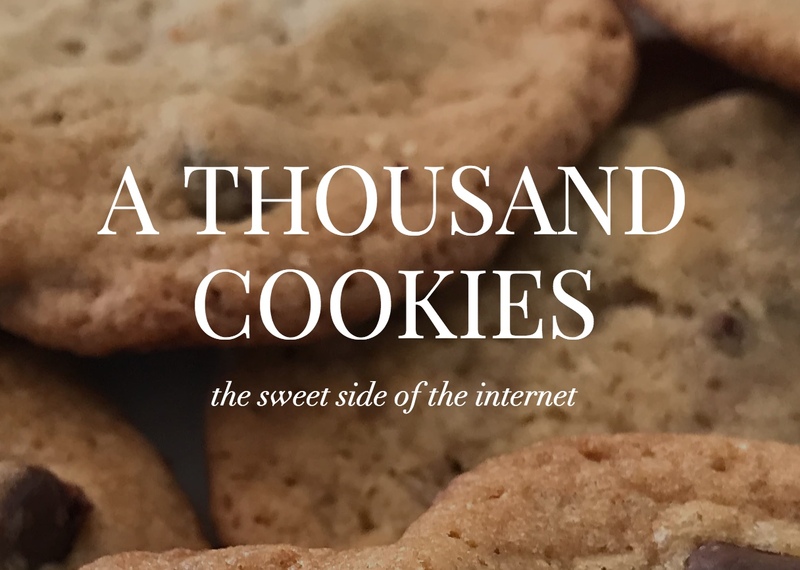 The internet is great, but it is hard to find good reliable resources. 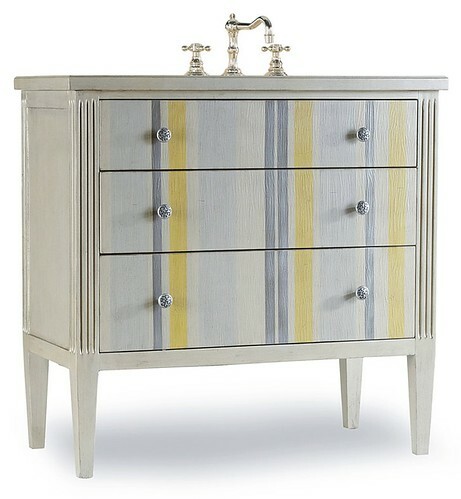 The yellow and blue painted sink vanity is exactly what I am looking for right now, for a little girl's bathroom. Thanks for this great overview of options. I love the variety of your selections and will pass it along to clients who need an update before putting their homes on the market or just because it's long overdue! Why in the world don't manufacturers understand THEIR VANITIES ARE TOO LOW..!?! if beloved husband could shave standing UP. No one listens. Lovely pieces, Holly. I'm a sucker for fretwork! Absolutely love it! Thanks Holly for the intro. 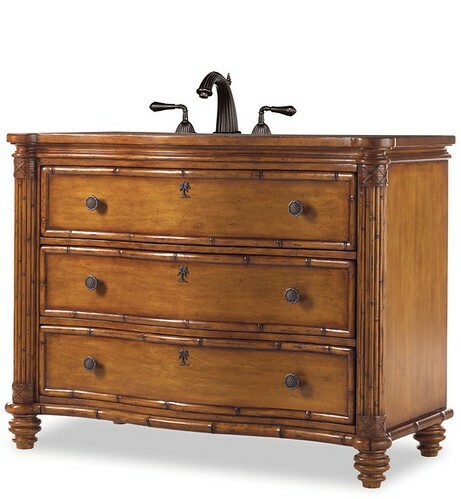 Incidentally I am about to be in the market for two vanities for the basement bathrooms. So will surely keep them in mind, I see some beauties here! 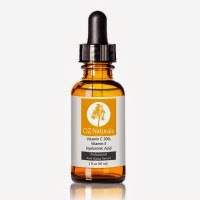 It's always great to know about a new source! Thanks for the heads up…I will definitely check them out! 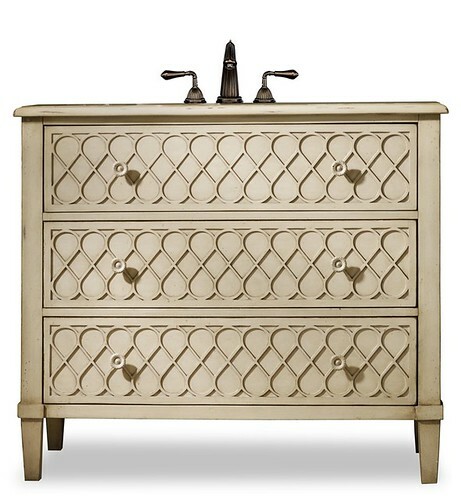 I'm with Katherine…a vanity from a custom antique piece is my first love. It's not always practical though! Hope you are doing well! Great resource Holly! We plan on moving to CO Springs in the next 12-18 months and I can imagine to get what we want some reno will be involved!